The PGFV Rehabilitation Centre was initiated in late 2006 and consists of a quarantine facility on the island of Evengue-Ezango and of Oriquet island. 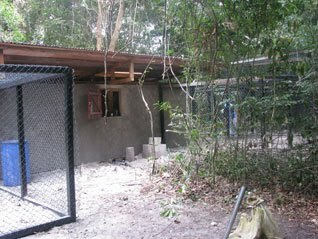 The quarantine facility was built in October 2007 and is a housing infrastructure where gorilla orphans confiscated by wildlife authorities are isolated for a minimum of 3 months for health screening. This helps minimize the possibility of diseases getting transmitted to humans or other gorillas at the site. The quarantine period also allows the orphan to gradually adjust to new surroundings and the keepers. Two keepers are assigned to a new gorilla orphan during the entire quarantine period. 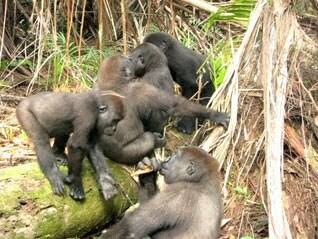 Once the quarantine period is over, the gorilla orphan starts his or her social integration with other gorilla orphans. Social ties within the group are crucial for promoting the group's reintroduction potential since you can never reintroduce an individual alone, only a stable group can be reintroduced. 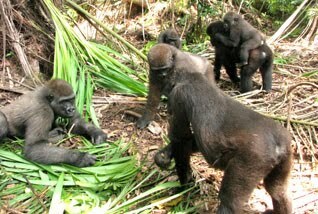 The group of gorilla orphans forage freely within the forest every day to learn, practice and acquire appropriate gorilla behavior and survival skills. The gorillas have moved one step closer to freedom on the island of "Oriquet", away from human infrastructures and activities. A small team of caregivers monitor the gorillas’ progress on a daily basis. Our hope is to one day reintroduce this group of young gorillas into the wild. the need to avoid getting the gorillas becoming too habituated to humans. At the PGFV, only the keepers have limited interaction with these gorillas as “surrogate parents”.